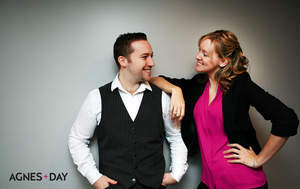 SOURCE: Agnes + Day inc.
MONTREAL, QC--(Marketwired - Jan 22, 2014) - Melissa Agnes Crisis Management announced today the rebrand of its firm to Agnes + Day. In addition to the debut of a new logo and company website, Agnes + Day offers businesses worldwide the opportunity to use a strong crisis intelligence team; reputation, legal and media experts trained in pre-emptive planning, mitigating risk, reputation management and damage control. "When faced with a crisis, most companies are reactionary and look to secure partial options," states Melissa Agnes, CEO of Agnes + Day. "They either go directly to their PR team or a one size fits all crisis firm. We're different. What sets our team apart is the combination of reputation and crisis managers, attorneys who specialize in Internet defamation, online privacy and social media law, and cyber investigators who all work closely together." With expertise in digital media, the Agnes + Day team provides a customized and targeted approach, keeping in mind the reality and scope of a crisis through all media today. Founders Agnes and her business partner, Colton Day, Chief Reputation Officer, along with their team, have been educating global companies on how to pre-plan and mitigate crisis to assisting these organizations that are often targeted for cyber attacks. Agnes + Day views digital at the core of a crisis and works with clients to tackle every size issue, with its intelligent and diverse team. With the official launch of Agnes + Day, the company places more intelligence behind crisis. For additional information on the rebrand or Agnes + Day services, please go to http://agnesday.com. Agnes + Day is the crisis intelligence firm providing mid- to large-sized companies worldwide the intelligence they need to prevent, manage and overcome any type of organizational crisis. Our mission is to continue to secure a client's reputation by providing them with the tools they need to manage the realities of today's crises head-on. Agnes + Day serves behind the scenes, helping to safeguard our clients' brands in times of dire need. About this company Agnes + Day inc.